Announcements about things like my cookbook, events, or changes coming to the show. A recap of videos I posted this month, so no sweat if you haven’t had time to keep up! Fan photos! I’m most excited about this! I will put together collage of beautiful photos of Thai food that HTK fans have made and shared with me in the past month. Links to interesting food-related articles/videos that you might also be interested in. 2) Try subscribing again, making very sure there is no typo in your email address. And if you STILL don’t see it, contact me! April 9, 2019 Welcoming Baby! February 28, 2019 I'm Going on Mat Leave! December 8, 2018 We're Expanding! July 3, 2018 Meet Me at Thai Festival TO & Van! April 4, 2018 Sawaddee Peemai Thai - Happy Songkran! February 1, 2018 Sawaddee Peemai 2561! 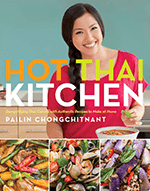 November 2, 2017 Cookbook Awards, Fish Sauce Tasting & More! August 31, 2017 Fluffy Milk Buns, Instant Noodle Salad & More!